We’ll begin the workshop exploring some of my work, and how I made certain creative decisions. Then, students will use critical literacy to delve into a text like an illustrator. What resources do you need for your workshop? I will adapt the workshop to the technology available. I will arrive with a laptop and an iPad, as well as traditional drawing materials. If a projector is available, I can connect the laptop and demonstrate the illustration process. If an electronic white board is available, I can show videos of the process. The presentation should happen with students at desks or tables, as we will be drawing. Students will need paper, pencils and erasers, as well as markers or pencil crayons. What is the maximum number of students per presentation? The maximum number of students is 30. 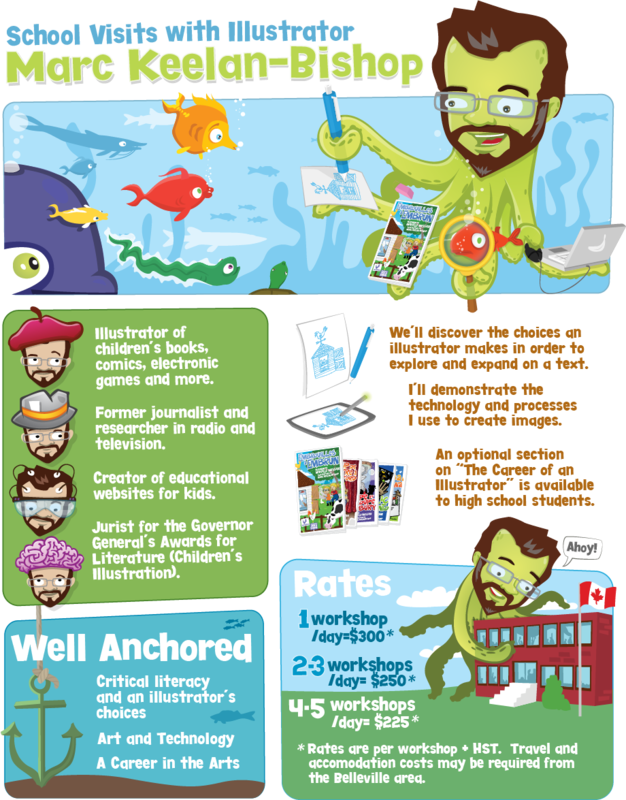 I do offer a reduced rate for multiple workshops in the same school. I live and work in beautiful Prince Edward County, near Belleville Ontario. I am one hour from Kingston, two hours from Toronto, and three hours from Ottawa. Do you offer this workshop in French?